This is the poem that runs along the bottom of this magnificent plate which appears in The History of that Most Victorious Monarch Edward IIId by Joshua Barnes, (10 January 1654 – 3 August 1712), an English scholar and Regius Professor of Greek. The full title of the book, published in 1688, is The History of that Most Victorious Monarch, Edward IIId, King of England and France, and Lord of Ireland, and First Founder of the Most Noble Order of the Garter: Being a Full and Exact Account Of the Life and Death of the said King: Together with That of his Most Renowned Son, Edward, Prince of Wales and of Aquitain, Sirnamed the Black-Prince. It represented the first study of Edward and his reign, and was a huge volume of over 900 pages. In it, Barnes undertook to describe ‘the Life and Actions of one of the Greatest Kings, that perhaps the World ever saw’. Magnanimous and courageous above all the princes of his days; apt for war but a lover of peace…. His recreations were hawking, hunting and fishing, but chiefly he loved the martial exercise of jousts and tournaments… devout to God, bountiful to the clergy, gracious to his people, merciful to the poor, true to his word, loving to his friends, terrible to his enemies… In short he had the most virtues and the fewest vices of any prince that ever I read of. He was valiant, just, merciful, temperate, and wise; the best lawgiver, the best friend, the best father, and the best husband in his days. This plate depicts Edward on the battlefield, during the Hundred Years’ War with France. The date shown is the so-called “Black Monday”. On Monday, 13th April 1360, a storm broke over the English troops who were out in the open on their way from Paris to Chartres. Thunder and lightning crashed overhead, the temperature fell dramatically, and huge hailstones rained down. 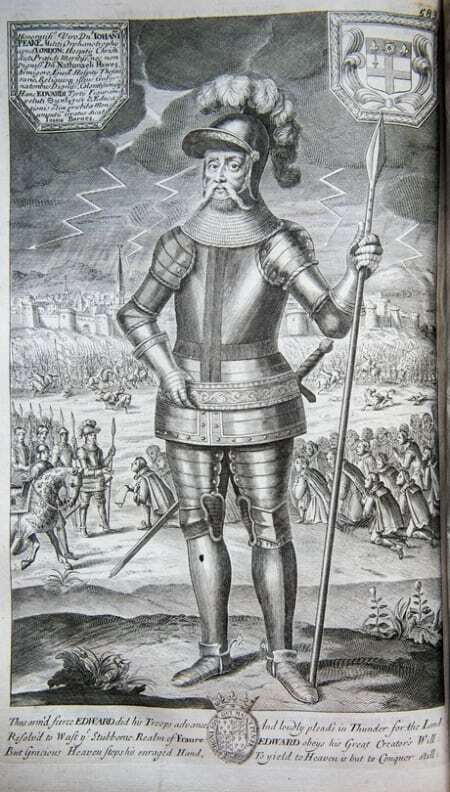 The hail storm killed an estimated 1,000 English soldiers, and up to 6,000 horses.1 One chronicler described it as “a foul day, full of myst and hayle, so that men dyed on horseback.”2 Two of the English leaders were killed and panic set in among the troops, who had no shelter from the storm. The heavy losses suffered by the English were seen by many as a sign from God. Edward was convinced to negotiate peace with the French. On May 8, 1360, the Treaty of Brétigny was signed, marking the end of the first phase of the Hundred Years’ War. Edward agreed to renounce all claims to the throne of France, in return for his acknowledged sovereignty over vast tracts of land in the north. The French would also pay a substantial sum for the release of their captive king, John. He returned to England in triumph, convinced he had ended the war. His attention could turn to more domestic matters, including the grand rebuilding of Windsor Castle. In November 2012, we celebrate the 700th anniversary of the birth at Windsor of this great medieval monarch, the man largely responsible for the castle as we see it today. 1. Barnes, J., The History of that Most Victorious Monarch Edward IIId (Cambridge, 1688), p. 583. 2. Kingsford, C.L. (ed. ), Chronicles of London (Oxford, 1905), p. 13.